This book has an introduction by Rosa Parks, whose arrest for breaking prevailing Alabama state law by refusing to give up her bus seat to a white passenger, sparked off widespread civil rights protests throughout America. Part of the protest was the boycotting of the Alabama bus company by black people which eventually led to the capitulation of the bus company and to changes in segregation laws. 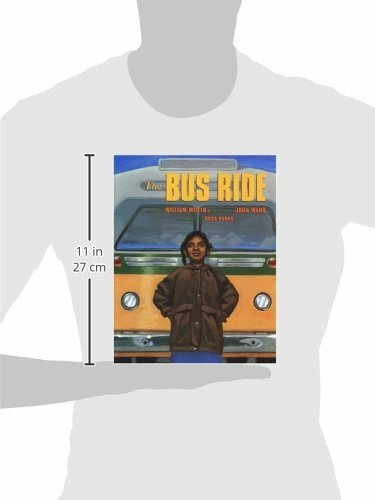 This picture book is based on a watered down version of this story, with an eight- or nine-year-old girl substituted for Rosa Parks. Though this ploy may more directly engage young readers, the disadvantage is that it obliquely suggests a diminished degree of courage required to confront the system i.e. if a child was capable of it, then Rosa Parks' action may not have been so extraordinary after all. However the book does get across the central message that however young one may be, one should always stand up for what is right.